Writers are readers. It’s in our DNA. We love good stories. We’re curious about the techniques and styles of other writers. We fill shelves and e-readers with books. But I wonder, will the e-book replace the traditional book or can they co-exist? Recently, I downloaded The Art of Racing in the Rain by Garth Stein into my Kindle. As I was reading, the e-reader ran out of power, something a book doesn’t do. I attached the power cord to the device, and plugged it into an electrical outlet in my office. Even though I could have continued to read under power, I decided to take a break. While reflecting for a moment about my love of reading, I looked at the full bookcases occupying one office wall. I realized I was caught in an affair between my books and my Kindle. How had this happened? Through the years my book collection had grown. Periodically, during spurts of housecleaning, I rummaged through the shelves and found books to donate to the local library or annual college book sale. But then I bought more books. An active reader, I folded down page corners, underlined sentences, and wrote questions and comments in the margins. I was often emotionally attached; the book became a good friend I wanted to keep. 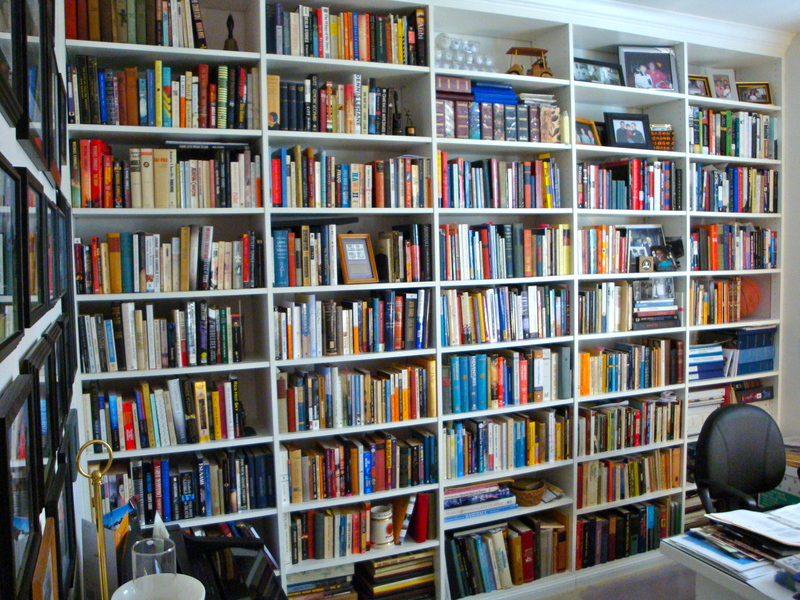 The shelves of books reflected my interests: fiction, poetry, theatre, biography, non-ficition, and books on writing. Except for a dictionary, thesaurus, and a few Writer’s Markets, the once full reference section was gone. After Google came on the scene, I had no trouble removing the heavy reference tomes from the shelves. I could do research right on my computer, making more room on the shelves for fiction and non-fiction books that interested me. Technology and Amazon made my trips to a bookstore less and less frequent, even though I loved to browse a store’s bookshelves. Buying books online worked much faster. A click and the book arrived in a few days. Keeping “book current” was easy. A best seller or an easy-read for a trip or the current selection for my book club could be in my hands quickly. But then a friend said, “Oh, you’ve got to get a Kindle.” And I did. Instead of having to wait a few days for a book delivery from Amazon, I bought a book and downloaded it in minutes. The e-reader was easy to carry on trips and in my purse. The e-books didn’t get dusty or take up space or just sit on the shelf once they were read. E-books were cheaper and e-book publishing opportunities for writers interested to me. A conundrum … why did I still have all those books? Why did I keep buying books? Perhaps it was a generational thing. I grew up in a book-loving home with traditional books, newspapers, and magazines. As much as I liked my Kindle, I still thrived on having a physical book in my hands with pages to turn. It still seemed a little clinical pushing the “next page” button. But I also believed in keeping up with the times. I remembered two debates from years past: movies versus television and then movies versus DVDs. The end of films and movie theaters was predicted. People would just stay home and watch their televisions, their DVDs. But they didn’t. Magical moments occurred when going to see a film – the people, the booming sound, the smell of popcorn, the collective feeling of tension, suspense or laughter. There were the Oscar Awards to watch, the Oscar parties to attend. Over time, television, DVDs, and film all found their markets. Two new debates were with us now : books versus e-books; traditional publishing versus e-publishing. Reading a traditional book was comforting. The experience seemed more intimate. And I wondered, at a book signing, how would an author sign an e-book? 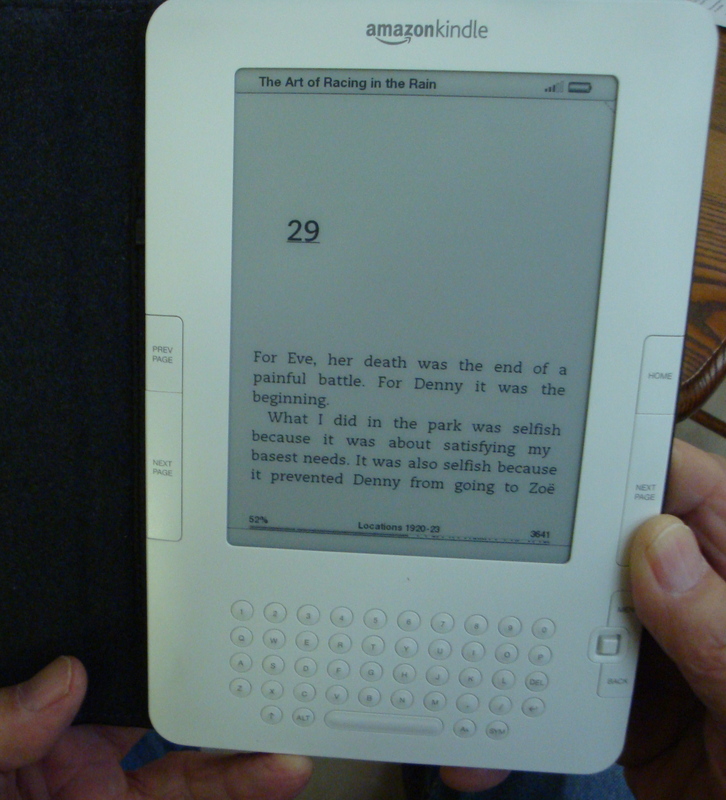 But there was something exciting about an e-reader: its ease, its speed, its small footprint, its future capabilities. I found I couldn’t commit totally to either a book or an e-book. Each offered sources for great stories, for learning craft, witnessing art. I believed a sustainable market existed for both. Why? Books and e-books provided readers with options to fit the time, the place, the pocketbook, the situation, and the individual. Books and e-books provided writers with the option of the traditional big-time press, the small independent press, the self-publishing houses, or the myriad opportunities of the digital press. Just as the television, DVD, and film industries adjusted and pursued their share of the market, I hoped traditional publishers and e-publishers would adjust the bottom line, go after their markets, and co-exist. My rumination was interrupted. I noticed the yellow light had changed to green on my Kindle. I returned to reading The Art of Racing in the Rain … to Denny and his dog Enzo. Any preference? Books? E-books? Join the comment conversation. This entry was posted in Books, e-books, Reading and tagged e-books, e-readers, Kindle. Bookmark the permalink. …I, too, have experienced the Kindle shut down, it is frustrating. But I can relate to the stream of book purchases for there is nothing like holding one to read it and knowing the pages won’t fall from site.blog, A jot on the calendar will make me a steady reader. Very enjoyable! Carol…Loved your Kindle story!! I do both…Kindle and tangible books. I cannot imagine ordering a cookbook or self help books on my Kindle. There are some things I must thumb through and hold! Hi Sunny – Thank you and I love your last line. So true. I’m still using books exclusively. I don’t have any immediate plans to purchase an e-reader, but know it would be great for travel. Most of my trips these days are by car, so books can ride along. Another favorite option for reading is the audio book. I love to listen to a great reader while traveling in the car, in the location we’re visiting and sometimes in the comfort of my home. My husband and I like to listen to them together and then talk about them, since we’re in the same place in the book at the same time. Hi Kerry – So true. Books, e-books, and audio books. In today’s marketplace, there are great choices for everyone. I love old books. I love all that makes up the book itself; the paper inside the cover, the type of print, where it was published, having a book marker that I love, etc… I know it has to be very convenient to own a kindle, but so much is missing from the experience of reading. It is about comfort for me. Loved this once and loved it again. So many of my same thoughts.